Thousands of Shards of Glass Imitate Blurred Motion in a Towering Public #ArtTuesday « Adafruit Industries – Makers, hackers, artists, designers and engineers! Dromeas, also called The Runner, is made of individual pieces of glass stacked atop each other to take the blurred shape of a runner in motion. Thousands of sharp, jagged pieces of glass form the sculpture. 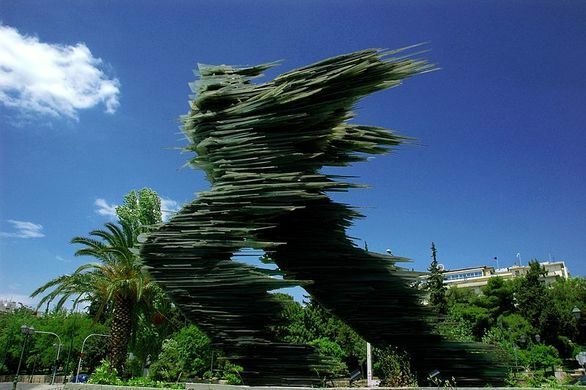 The running figure is the work of Costas Varotsos, who began working on it in 1988 and didn’t finish until 1994. It was originally erected at Omonia Square, but it was later moved because people grew concerned construction and the vibrations from the underground metro would cause it to shatter or topple.